From the time you arrive at this beautiful mountain top, you will truly fall in love with the views all around the lodge. Take a stroll around the property and pay close attention to all the beautiful flowers, from lilacs and cucumber magnolia blossoms in the Spring to all the many varieties of flowers painting the Summer and Fall. Walk with the horses and dogs out into the 14 acre pastures, look for an occasional deer and enjoy nature. The grounds around the lodge have been used for weddings including the daughter of Jesse. VIEW OF QUARTERHORSES IN FIELD BESIDE LODGE AND BEING FED CARROTS AND PETTED BY A GUEST NAMED JANET, OUR AND THEIR NEW FRIEND. 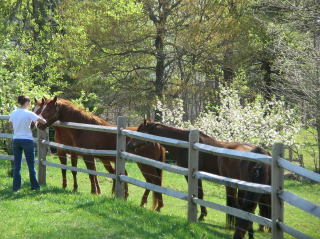 THE HORSES GRAZE INSIDE FENCED GROUNDS ALL AROUND THE LODGE. YOU WILL ALSO SEE OTHER PETS AROUND INCLUDING OUR BLACK GERMAN SHEPHARD STORMY, 3 CATS, FUZZY A BEAUTIFUL BOY WHO JUST SHOWED UP HERE AND WHO HIDES FROM GUESTS UNLESS HE REALLY TRUSTS THEM AND OUR 2 SISTER CATS DAISY DUKE AND LUCY HOGG. THEY WERE FOUND BY JESSE'S DAUGHTER MARY SHUT UP IN A BOX WHEN THEY WERE TINY KITTENS. I THINK MARY THOUGHT WE NEEDED A COUPLE OF KITTENS AND SHE WAS RIGHT, BONNIE THOUGHT SO ALSO!!! THEY WILL BE 11 YEARS OLD THIS MAY 2016. WE ALSO HAVE A LITTLE SHIH TSU NAMED LILY BELLE WHO WILL BE 8 IN MAY 2016. WEDDING IN ONE OF OUR MEADOWS (CHASE'S MEADOW) APPROX. 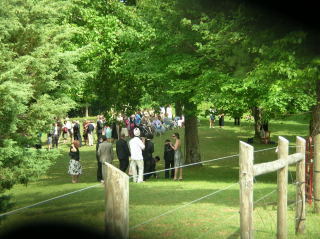 95 PEOPLE ATTENDED AND THEN THE WEDDING RECEPTION WAS HELD AT OUR LODGE IN THE GAZEBO AND BACK YARD AREA. EXCELLENT SETTING AND GROUNDS TO SET UP BANDS FOR PARTIES AND CELEBRATIONS. 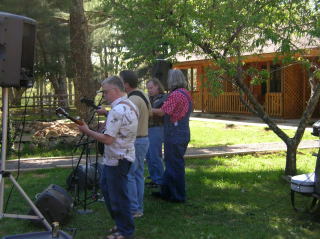 BLUE MULE BAND - WWW.BLUEMULEMUSIC.COM ENTERTAINING GRADUATION CELEBRATION SET UP IN RIGHT SIDE YARD.